July is here and the construction of the Mach Factor 2 project continued. The construction has been going well with only a few disagreements on construction techniques and possible paint schemes. The largest disagreement has been over the name of the rocket. Ben and JP want to name the rocket The Fast and Furious from a Vin Diesel movie. Joseph and I are not big fans of Vin Diesel so we vetoed that name. 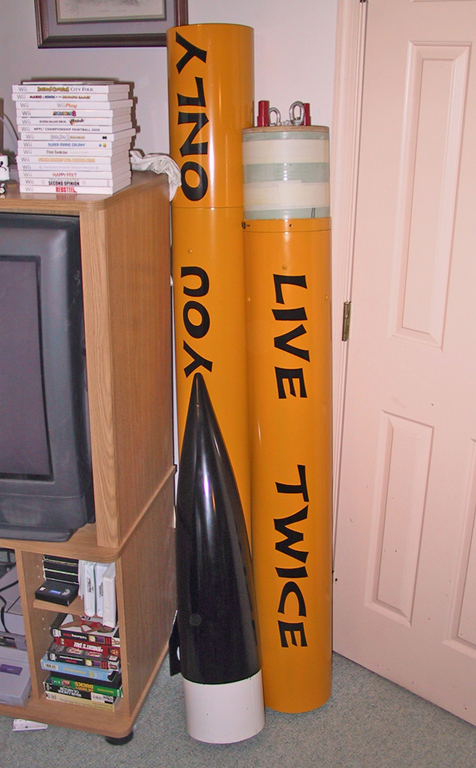 I want to name it The World is not Enough to stick with the James Bond themed rockets but was vetoed as well. Joseph wants to name the rocket Passing Wind and I suggested its variant Breakin Wind. As this debate goes on, construction continued. Launch buttons could not be used due to the rocket’s minimum diameter. The screws to secure the buttons would protrude into the airframe and interfere with the 54mm motor casing. We toyed with ideas such as break away buttons and mortar type launch systems but somehow safety prevailed. Go figure! As much as we hated to, we installed two drag-inducing rail guides to the outside of the airframe. It is very important for the rocket to launch straight and quickly gain altitude. If it should come apart, it is better to come apart in the air, over everyone’s heads rather then in their faces. Hopefully the drag from the rail guides will not be too extreme. The final touches were put on the aft sustainer. We wanted some of the beauty of the carbon fiber to show so we only primed part of the aft sustainer. We do not know the final colors yet but know part of the rocket must be painted to make it easier to find it in the fields, or god forbid, the trees. 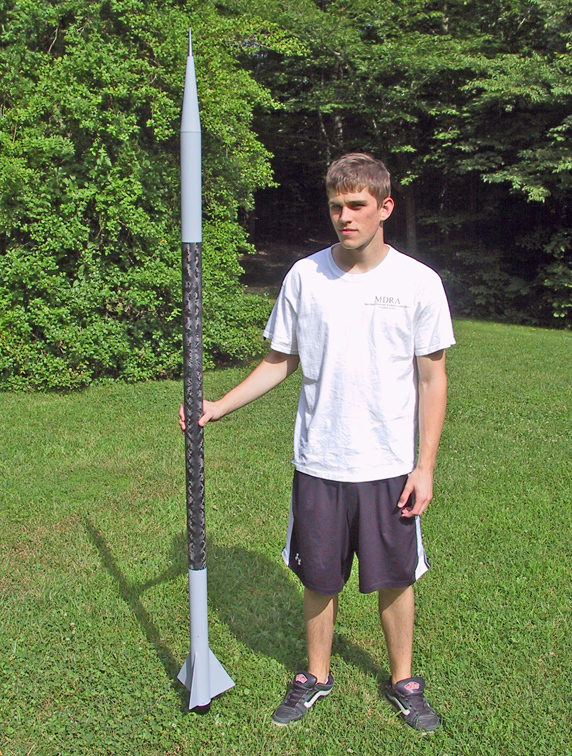 The rocket was primed and sanded multiple times. The upper section and nose cone was also primed and sanded until the surface was smooth as silk. Joseph started designing some paint and decal schemes. In the meantime, JP ordered the Parrot Altimeter. This is the smallest and lightest altimeter that will fit and can stand up to the predicted 54 Gees. The 54mm, 2800ns, 28.6 inch Loki motor case arrived and was successfully test fitted. It will occupy over 60 percent of the aft sustainer and the empty motor case will weigh more then the projected weight of the entire rocket. 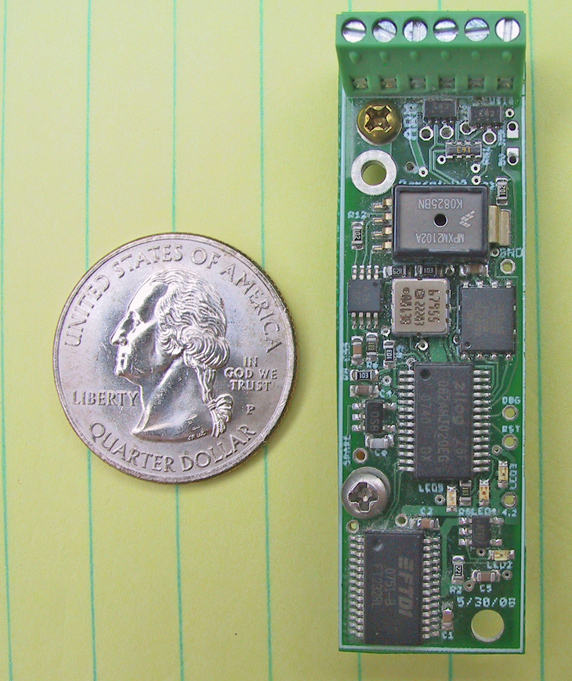 The very small Parrot altimeter also arrived which will allow the electronic bay construction to continue in August. As July draws to a close, the Damm Abresch Boys are still undecided about the rocket color and still bickering about the rocket’s name. Hopefully these issues will be resolved in August.